You know I bought this body wash because of the name. The Jersey Cow Company. How cute is that? Visiting the Island of Jersey is on my list of things to do one day (I have a feeling it's going to be very different than my home state, its namesake). I also have a thing for Jersey cows, just because. The Uplift body wash has nothing to do with dairy, but the company is, indeed, from the Island and that's where their products are made of locally grown and distilled raw materials. Uplift body wash is based on the invigorating aroma of lime, eucalyptus and lavender. The scent is very herbal and natural, which makes sense considering the light and not particularly sudsy texture of the product (always a good sign when dealing with my ultra-dry skin. Showering with this cow is a wonderful pleasure. The scent fills my bathroom, clears my sinuses but magically never clings to either my skin or my towels. It doesn't leave any tightness or dryness behind and my very sensitive skin feels perfectly fine after the shower and not screaming to be buttered. Aqua (Water), Ammonium Lauryl Sulfate, Cocamide DEA, Sodium Chloride, Glycerin, Cocamidopropyl Betaine, Aloe Barbadensis Leaf Juice, *Lavandula Angustifolia (Lavender) Oil, Pelargonium Graveolens Flower Oil, *Citrus Aurantifolia (Lime) Oil, Disodium EDTA, Citric Acid, Benzyl Alcohol, *Eucalyptus Globulus Leaf Oil, Methylchloroisothiazolinone, Methylisothiazolinone, Triethylene Glycol, Propylene Glycol, Magnesium Nitrate, Magnesium Chloride, Sodium Benzoate, Potassium Sorbate, Citral, Geraniol, Linalool, Citronellol, Limonene. Bottom Line: The rest of the bovines from this line (hair products and lotions) are in my very near future. 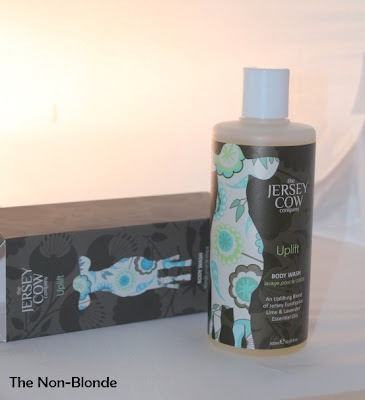 Uplift Body Wash by The Jersey Cow Company ($26, 10 oz) is available from beautyhabit.com. 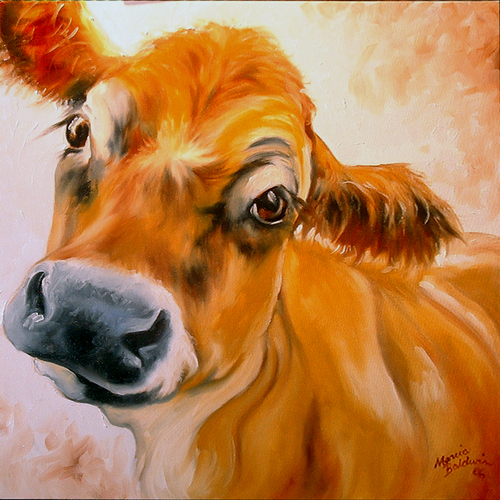 Art: My Jersey Cow by Marcia Baldwin, 2006.